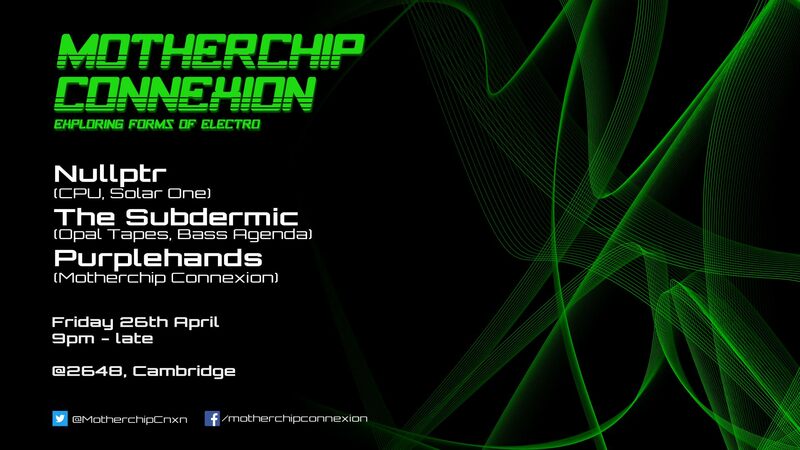 Cambridge’s underground electro night returns to our basement bar for the first party of 2019. Exciting night, with three amazing DJs taking over the decks. Fresh from his releases for scene heavyweights, Nullptr will be serving up some quality electro and braindance tunes, including a few tasters of brand new material. Bringing the harder techno sound to the party is The Subdermic. With recent releases on Acid Worx, Opal Tapes and her own eponymous imprint, expect abrasive and industrial techno with an experimental edge. The mastermind of the operation, Purplehands’ vinyl-only electro sets are guaranteed to devastate the dancefloor.